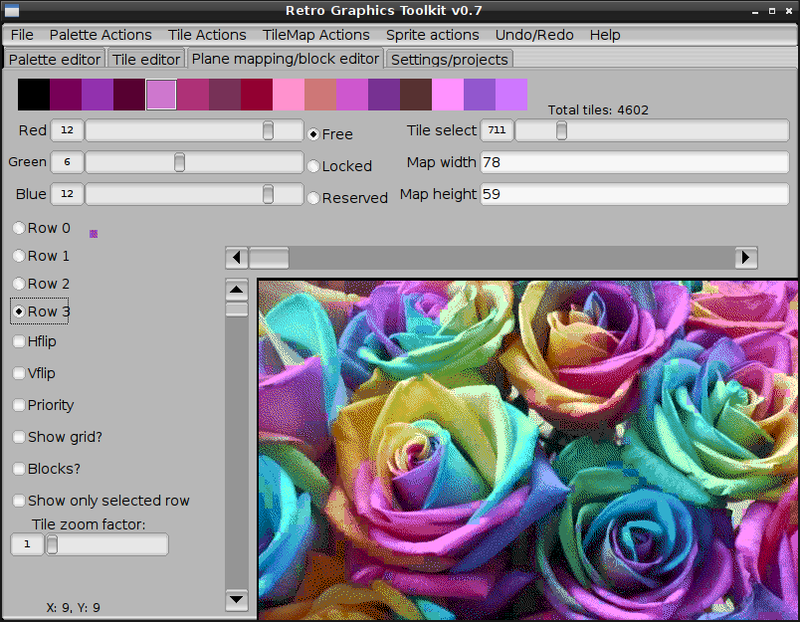 Retro Graphics Toolkit is a GPLv3 or later licensed open source graphics editor that stores truecolor information in addition to regular tiles. This allows for non destructive editing of palettes. When the palette is changed the tiles can be dithered to fit the new palette. With Retro Graphics Toolkit you can save palettes, tiles, tilemaps, sprites and levels for the Sega Genesis, NES, Master System and Game Gear. Support for more systems is planed for future versions. Although there is nothing special about the format outputted by Retro Graphics Toolkit (complying with existing formats for the system is one of my goals). I do provide examples currently for the Sega Genesis, NES, Master System and Game Gear. The plane editor is what you will be using when importing an image and displaying on the game system. You don't even have to worry about making sure your image's dimension are a multiple of the tile width and tile height for the system. 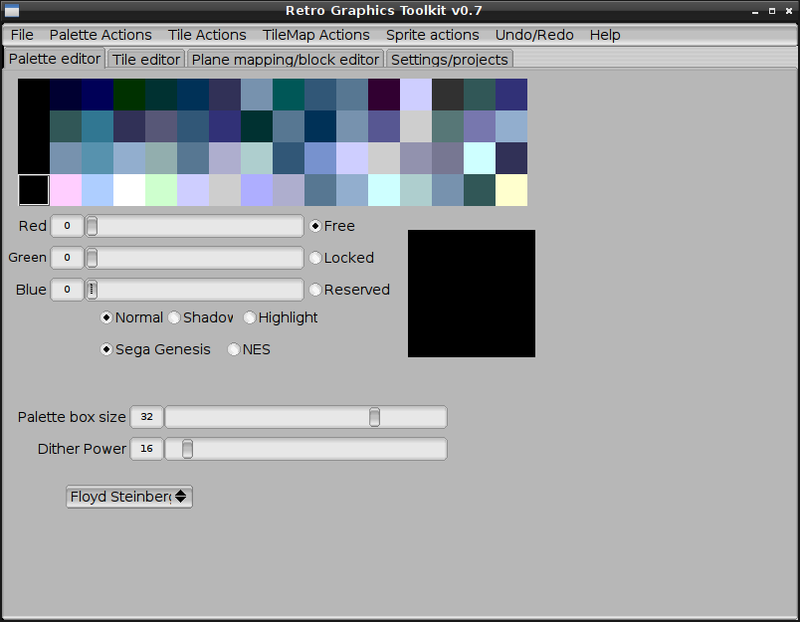 Retro Graphics Toolkit can center images to conform to tile size. This makes it very easy to directly import an image. Also a selection of color quantization algorithms and ways to pick which tile uses what row allows for quick and easy high quality images. 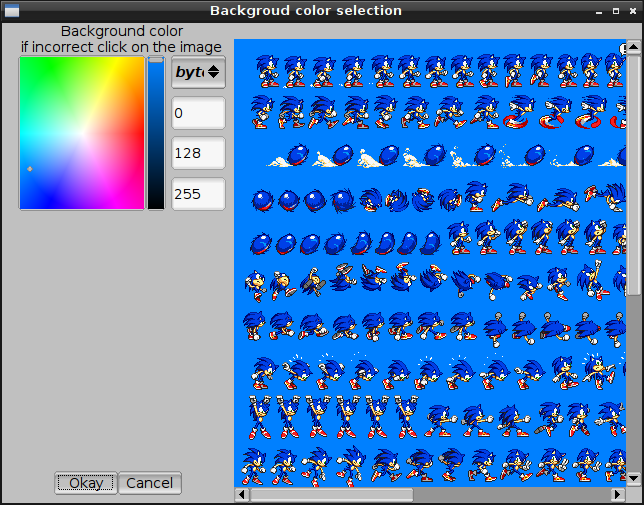 Retro Graphics Toolkit features an advanced sprite editor capable on creating groups making alignment much easier, even including buttons to do very easy alignment and Retro Graphics Toolkit can import an image creating a sprite group large images are divided up using as few sprites as possible. If a background color was used that is treated as transparent. Next line segments are created and those line segments are merged to create rectangles. The longest line segment determines the width and height of the rectangle that is created. The level editor is a new feature starting in version 0.8 RC1. 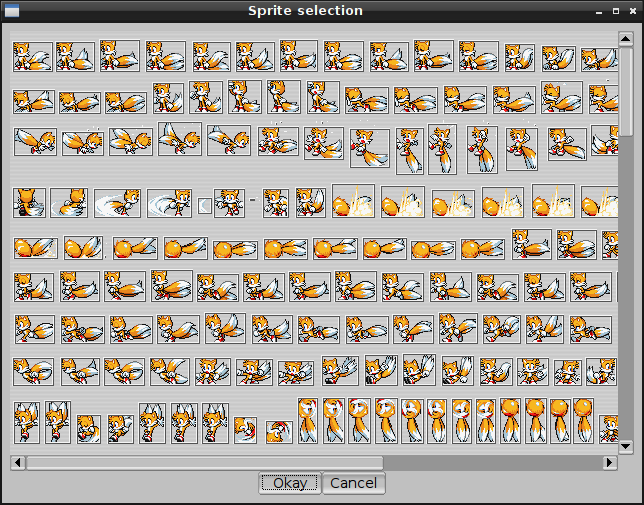 Sprites from the sprite editor can be displayed on the level editor as well. The easy to use palette editor is great for viewing the entire palette at once making changes a breeze. Levels are constructed with chunks. 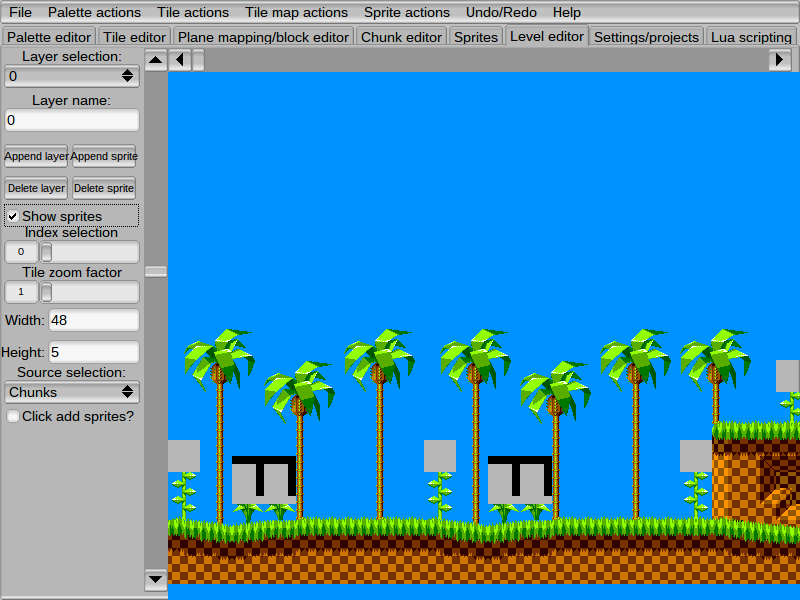 This shows Green Hill zone's graphics converted to the NES. And it looks much better than Somari. This shows the power of Retro Graphics Toolkit. To download the windows binary click "View Raw" (without the quotes). If you have any bug reports, feature requests, pull requests or patches I would like to hear about them. With Lua scripting it should be much easier to get Retro Graphics Toolkit to do what you need as opposed to writing your own tool. If you made any useful Lua scripts be sure to post them. Last edited by sega16 on Thu Jul 09, 2015 5:01 pm, edited 10 times in total. Edit new link now hosted at github expect update to date binaries now. Last edited by sega16 on Tue Jun 04, 2013 11:22 pm, edited 3 times in total. Awesome ! I will try it asap ! Windows version wants libgcc_s_dw2-1.dll and libstdc++-6.dll. I have dowload them but it still doesn't work, crashes at start. I've tried two different versions of .dll. ... I've found working dlls.. but program still not work. It opens pal and map, but can open tiles. msg: File cannot be loaded. Also (bug or feature?) if resize program window, program just scale up all UI ... viewable area not increases. The Dll errors are caused by me not statically linking libgcc and libgccstd++ I will fix that shortly once it is fixed I will make another reply. 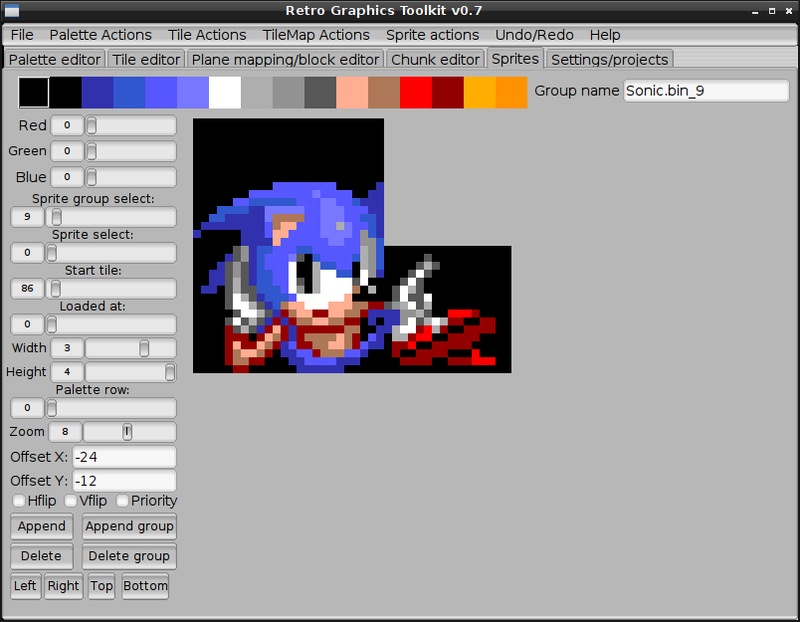 After you hit generate optimal palette from row you must hit dither tilemap as image. As for the tiles they are only supposed to scale to what you set them to with the tile zoom factor slider. If you had DLL errors with the windows binary please re-download. Last edited by sega16 on Tue Jun 04, 2013 11:22 pm, edited 2 times in total. As I see option 4 rows palette is not work yet. Ohh.. no can't use; it happens just because I loaded map that already used 4 palettes. Compare with other editors like YY-chr: you edit tile - you see result on screen. So my suggestion to make pal+map+tiles editor on single screen, like in most tile editors. Ti_ I fixed the open tiles glitch but no new windows binary yet. I am going to set up gentoo to build the windows binary instead of me having to reboot into windows (Mingw is for GNU/Linux too not just windows). If you cannot wait the change is in github. You can select which row you want the tile to use in the tilemap editor by clicking on the row radio buttons. 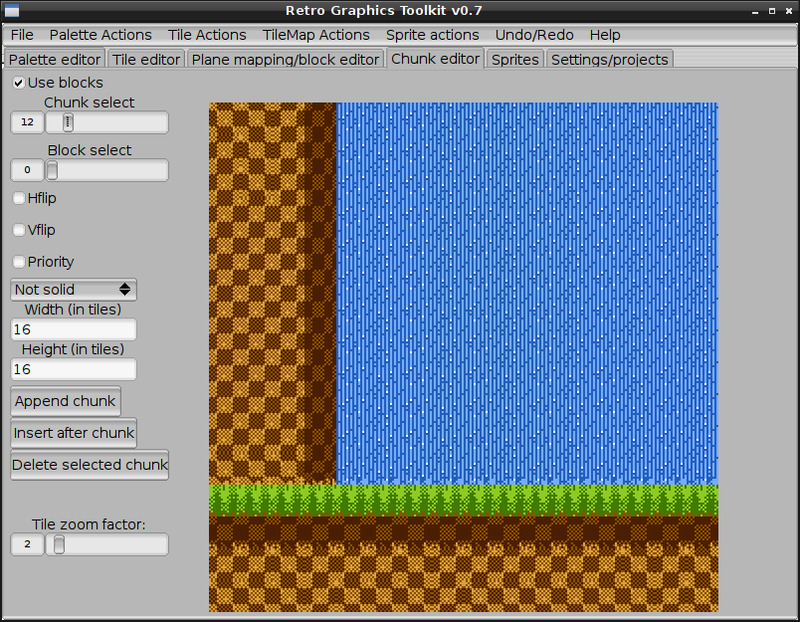 Then left click on the tilemap view area to place it. Right clicking on the tilemap will give you more information about the tile your mouse is over. Also in the tilemap editor you can click on the tile and it will draw the currently selected color to the tile. This is nice tool. Thanks! sega16 wrote: Ti_ I fixed the open tiles glitch but no new windows binary yet. I am going to set up gentoo to build the windows binary instead of me having to reboot into windows (Mingw is for GNU/Linux too not just windows). Will be updated version for WIN? or can you explain how to compile it. Cool. I want to see it. Will you release win32 version? Last edited by sega16 on Tue Jun 04, 2013 11:23 pm, edited 1 time in total. Tested: only 2 palletes generated, not 4. Wrong colors on image. Palettes not saved to tilemap. In 16-colors mode, it provides different picture, than previous version of retrogfx. If you have changed algorithm, why u not kept old, or it's a bug too.